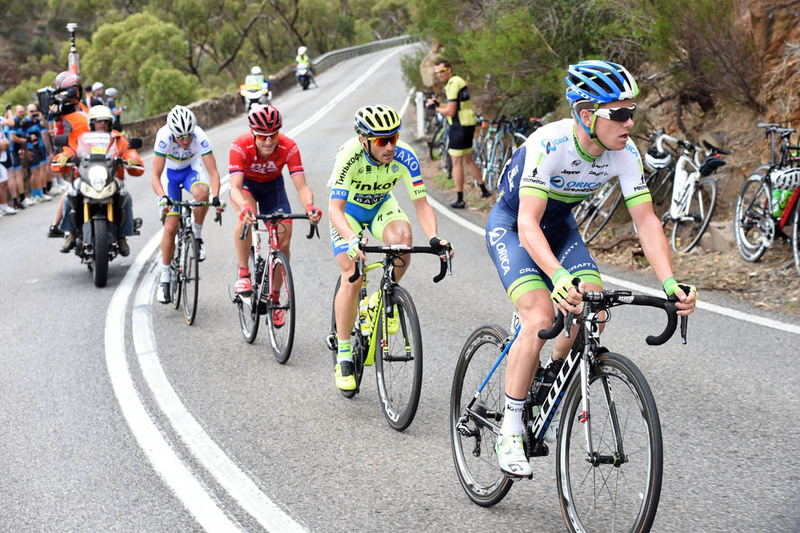 Spaniard Juan Jose Lobato won stage two of the Tour Down Under today with Jack Bobridge maintaining the overall lead, for now. Lobato out-paced Daryl Impey (Orica-GreenEdge) and his Movistar team-mate Gorka Izagirre Insausti to take line honours on the uphill drag in Stirling with title favourites Richie Porte (Sky), Cadel Evans (BMC) and Tom Dumoulin (Giant-Alpecin) finishing inside the top 10. “It’s nice to get that one out of the way today and tomorrow is the first real summit finish,” Porte said with promise post-race. The 26-year-old Lobato has embarked a strong start to the 2015 WorldTour season with a second place finish to Marcel Kittel at the prelude People’s Choice Classic criterium preceding his victory today. Cameron Meyer (Orica-GreenEdge), Campbell Flakemore (BMC) and Thomas De Gendt (Lotto Soudal) comprised the main break of the day escaping within the opening 25km after a flurry of attacks at the start. The trio were allowed a maximum time advantage in excess of three minutes with Sky and IAM contributing to the pace-making. The group however was reeled in on the first lap of Stirling with numerous general classification teams also coming to the fore. Calvin Watson (Trek) and Danilo Wyss (BMC) countered but their effort was short-lived. Cannondale mistimed its lead-out on the home straight as a reduced group came to the line with Lobato taking advantage. Bobridge’s UniSA-Australia sports director Dave Sanders was pleased with the efforts of his young national composite team, which was somewhat hampered when Robert Power suffered a mechanical at the business end of the race. The 25-year-old Bobridge announced a return to form with his stage victory yesterday and was again strong today mixing it with the popular title favourites. Despite that, Sanders is not confident the South Australian will keep the ochre jersey through to the end of the week. Meanwhile, a BMC spokesperson has confirmed that Flakemore broke his left collarbone whilst riding back to the race team hotel after stage two. It’s a blow for the rookie pro whose performance in Adelaide and previously at the Australian national championships heralded praise from Evans.